Access to safe potable water (drinking water) is an essential part of everyday life. It is therefore important to ensure that the quality of such potable water supplies and their delivery systems are maintained to the highest standards so that the water supplied is safe and wholesome at the point of delivery. To ensure potable and domestic water systems meet the required standards of water quality, cleanliness, and microbial control and are correctly maintained and operate at optimum efficiency it is essential that the correct drinking water conditions are established and maintained consistently. Without the correct treatment, drinking and domestic water systems can suffer from scale formation, corrosion and red water problems, and can become a breeding ground for harmful bacteria including legionella bacteria. 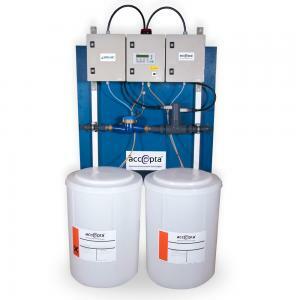 Accepta’s comprehensive range of high-performance potable water treatment chemicals have been scientifically formulated to ensure drinking and domestic water systems are protected and the users are safeguarded from harmful microbes. Our product range includes highly effective disinfectants and biocides, scale and corrosion inhibitors, and advanced multi-functional formulations. Chlorine dioxide (ClO2) is a highly potent, fast acting bactericide and virucide that is effective at concentrations as low as 0.1 ppm. Chlorine dioxide does not form toxic by-products and is effective over a wide pH range in both hard and soft water. It will eliminate both planktonic and sessile bacteria, disinfect surfaces and rapidly destroy problematic biofilm. These properties make it ideal for use in a wide range of water sterilisation, disinfection, environmental hygiene, industrial and process water treatment activities. Activ-Ox is Accepta’s all in one dosing system for Safe, High Efficiency and Cost Effective drinking (potable) water treatment.